This summer, I have had the opportunity to complete my summer field experience in New York at the United States Military Academy, better known as West Point. This site is incredibly unique—although I am assisting the athletic trainers in the Office of the Department of Intercollegiate Athletics (NCAA Division I sports), there is also the club sport and intramural sport level. Every cadet is required to participate in one level of sports each season, in addition to their regular physical training. There is a separate athletic training department with 4 athletic trainers for club level sports, intramurals, and injuries sustained during physical education courses. Additionally, there is a physical therapy department which handles injuries outside the Academy. Cadets are a unique population, especially the cadet-athlete, considering their courses and field training consist of physical maneuvers. 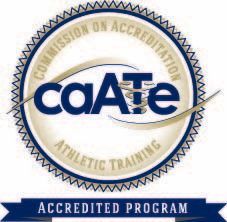 This requires cadets to be physically ready for tasks at all times, meaning injuries sustained can have larger consequences than for the average collegiate athlete. A cadet injured may have to retake physical education courses depending on the time or severity of injury. Each day I have learned something new—from West Point specific acronyms, training, and rules to improving performance for injured athletes. 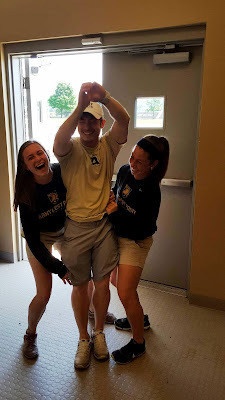 With the other athletic training student, Erin Guida, from University of Tennessee- Chattanooga, I have been able to have hands-on experience. We have been on a two week rotation with Men’s Rugby, who we got to see win the CRC Bowl Championship in Philadelphia, as well as spending time with Football rehabilitation. We have also been able to work with the Physical Therapy department to assist and observe Sick Call. Sick call is the way West Point handles acute injuries—cadets report to the Physical Therapy department at 0630 and can wait in line to receive care from one of the physical therapists. It is hard to know what you will get with sick call—one day it could be one cadet, another day it could be 50. It depends on the point the cadets are in training, as well as time of year. One highlight of my experience so far has been visiting Camp Buckner for Sick Call. Camp Buckner is where the cadets will complete various summer trainings—all rising seniors (or firsties) just recently finished 4 weeks at Buckner, complete with a 12-day field experience. One of the football players we have been working with has been at Camp Buckner, so his ability to perform rehabilitation depends on his duties for the day. Each cadet is different depending on their major and year in school, so I am learning a lot about the many facets of military education and training. 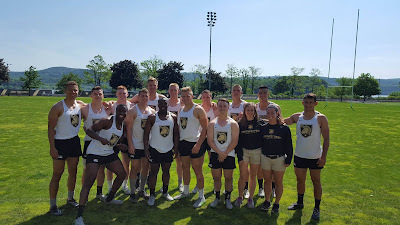 One of the best parts about West Point has been working with many of the 17 athletic trainers that work in the Division I sports department (ODIA). 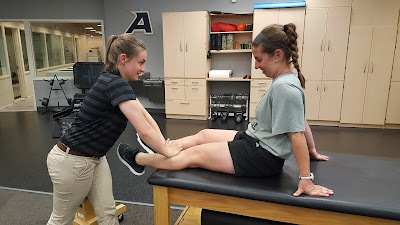 Having many different views and strategies allows me to learn comprehensively—often I will ask a question of several of the athletic trainers to get a wide variety of viewpoints. In addition, the incredible physical fitness of many of the cadet-athletes makes rehabilitation a learning experience—we have had athletes do a bench press or rows with a 30 lb bar with kettlebells attached by Theraband. It is much harder to challenge someone in incredible physical shape, and being with Football and Rugby has allowed me to explore new creative options for rehabilitation at a high level.